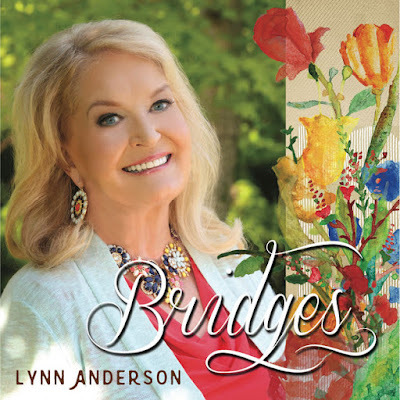 Lynn Rene Anderson (September 26, 1947 – July 30, 2015) was an American country music singer known for a string of hits throughout the late 1960s, 1970s and 1980s, most notably her 1970 worldwide megahit "(I Never Promised You A) Rose Garden." 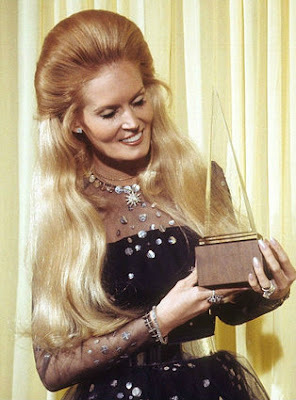 Anderson's crossover appeal and regular exposure on national television helped her to become one of the most popular and successful country singers of the 1970s. She was born in Grand Forks, North Dakota, but grew up in California, where her family moved when she was four. 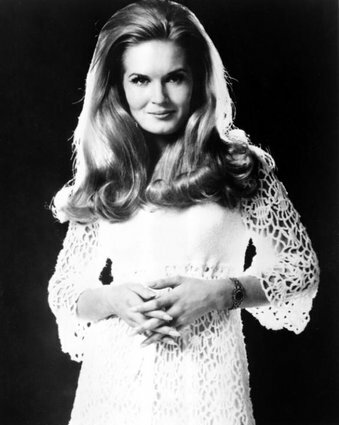 Her father, Casey, was a car salesman, and her mother, Liz, enjoyed some success as a country songwriter in the 1960s. 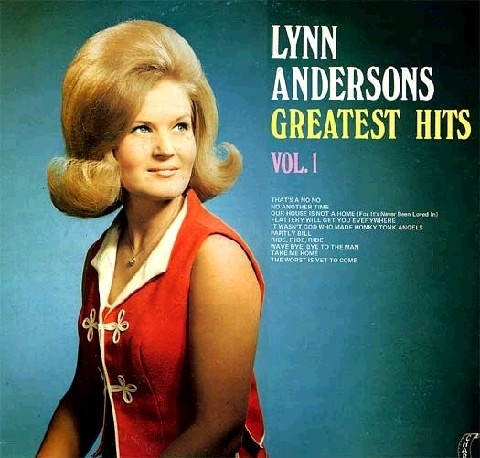 Liz Anderson composed Just Between the Two of Us, a hit for Merle Haggard and Bonnie Owens in 1964, and Haggard’s 1966 solo hit, All My Friends are Gonna Be Strangers. The Haggard connection proved crucial to launching Lynn’s own music career. On a trip to Nashville with her mother, she sang informally with Haggard. Slim Williamson, owner of the small Chart Records, heard this performance and promptly offered Anderson a recording deal. 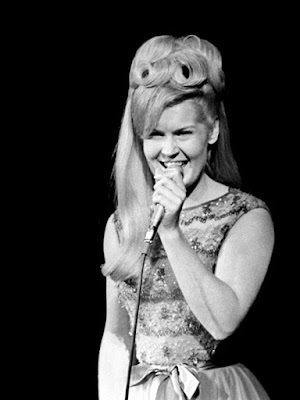 Between 1966 and 1969 she had several minor country hits on Chart, notably I’ve Been Everywhere, Rocky Top and Too Much of You. At this time she was appearing regularly on national television in the Lawrence Welk show and occasionally touring with the Welk orchestra. Anderson was best known for the worldwide crossover hit that she had in 1971 with Rose Garden. 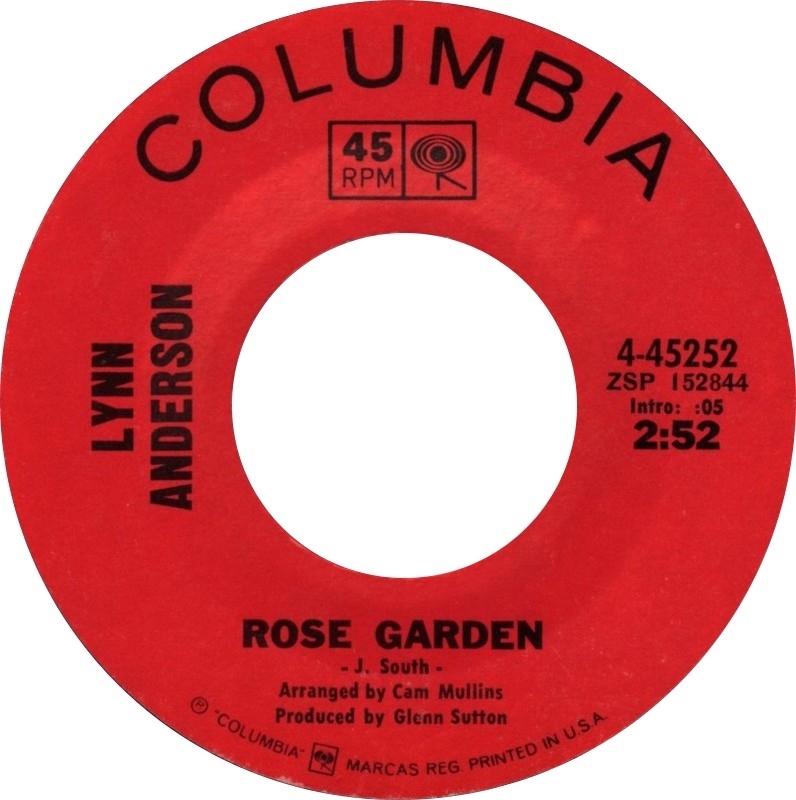 The song’s lyrics, written by Joe South and sung with unsentimental authority , dispensed hard-won wisdom about matters of the heart: “I beg your pardon, I never promised you a rose garden/ Along with the sunshine, there’s gotta be a little rain sometimes.” Lynn Anderson attributed its wider success, however, to her fellow Americans looking for something positive to take from the debacle of the Vietnam War. The song reached No 3 on the US Billboard pop chart and climbed to the same spot in the UK. 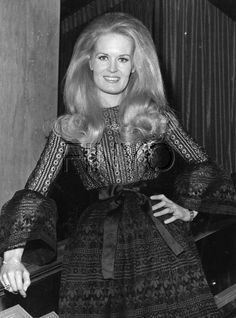 This led to a memorable appearance by Lynn Anderson – all back-combed hair and yellow maribou feathers – on Top of the Pops. The single was No 1 in Germany and the LP of the same name from which it was taken remained for a quarter of a century the biggest-selling by a female country artist, until the advent of Shania Twain. Although she went on to perform it for five US presidents, the song made her most proud, she said, when she appeared at a concert in Texas hosted by Bob Hope for soldiers returning from Vietnam. An operations base in neighbouring Thailand was known as “Rose Garden” and as she sang the opening notes of her signature tune, 5,000 Marines in dress uniform rose as one to salute her. 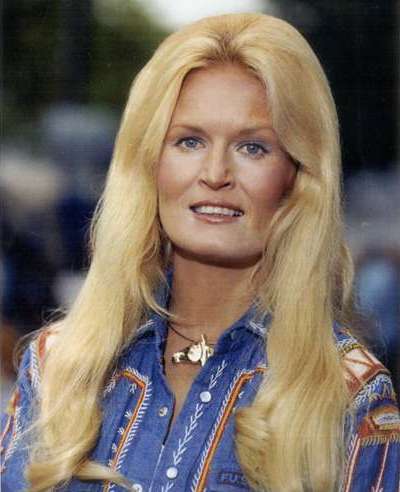 In the 70s she received numerous awards, including a Grammy in 1970 for Best Country Vocal Performance, and topped the country charts with such songs as You’re My Man, How Can I Unlove you, Keep Me in Mind, What a Man, My Man Is and Even Cowgirls Get the Blues. Following the success of Rose Garden, she became, in 1974, the first female country singer to sell out Madison Square Garden. Yet by the end of the decade, her popularity was in decline and her last country hit of note came in 1983. She was especially popular with British country music audiences, appearing several times at the annual international festival held at the Empire Pool, Wembley, now Wembley Arena. Anderson also starred as a country singer in Wreck on the Highway, a BBC Scotland television play in 1990. Her parallel career as an equestrian began when she won the California Horse Show Queen title in 1966. She competed in show horse and cutting (separating a single animal from a cattle herd) events for many years and raised horses at her ranch in Taos, New Mexico. Her marriage to Sutton ended in divorce, as did her second marriage, to the Texas oilman Harold Stream III. 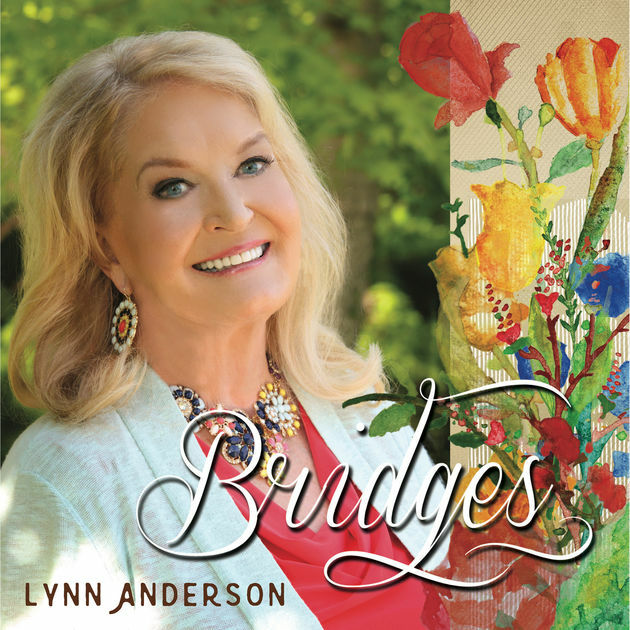 Her partner in recent years was the songwriter Mentor Williams, whose best- known song, Drift Away, she recorded in a new gospel version for her final album, Bridges, which was released in June 2015. Here's Lynn at the Durango Music Spot, Nashville Music City Center, Nashville, Tennessee - Friday 7. June 2013.